Should jolly old Saint Nicholas become jolly old Saint Nicola? 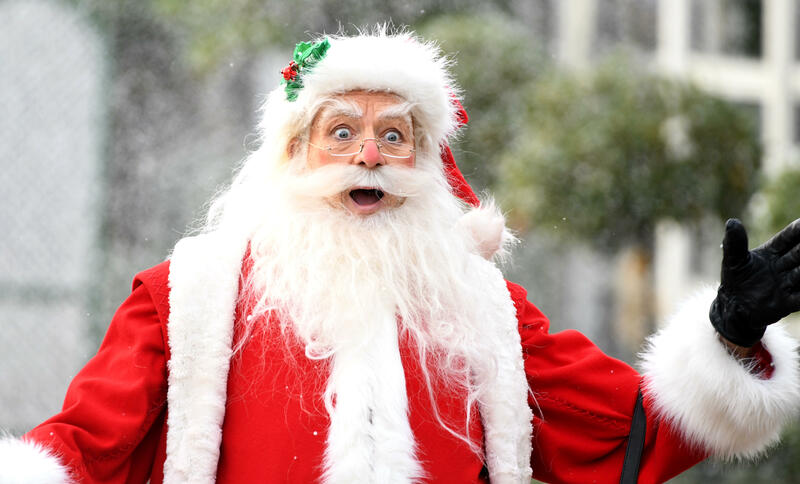 Should Santa be gender neutral? More than a quarter of people who responded to a new online survey by GraphicSprings say yes. And that's not all. When asked how they would modernize Santa, twenty percent of people responded that he should have tattoos. Eighteen percent responded that his iconic red-and-white suit should be replaced with skinny jeans. And twenty two percent said that Santa should ditch the sleigh in exchange for a flying car. Seventeen percent of people preferred a hoverboard to a flying car, though it's unclear what role, if any, Rudolph and the other reindeer would play in that scenario. And forget cookies. Twenty one percent of people who responded to GraphicSprings' survey suggested that Santa should go on a diet – though it's hard to imagine leaving a crudités platter out in the living room the night before Christmas. The graphic design company used Google surveys to collect responses from 400 people across the U.S. and U.K. on how they would rebrand Santa with a more modern edge. A selection of those choices was then circulated to and voted on by a wider group of 4,000 people, with the most popular selections ultimately visualized in the graphic above. Earlier this holiday season, when a Bay Area radio station stopped playing the Christmas classic "Baby It's Cold Outside" over the #MeToo undertones in its lyrics, the backlash was swift and intense. And that was just one song. So, it's difficult to overstate how great the outrage would likely be if the world were to ever actually rebrand Santa Claus. These responses, however, are indicative of a cultural shift when it comes to the perception of gender. A number of states in the U.S. have now recognized a non-binary gender option, "X" on birth certificates and driver's licenses. And far more U.S. teens are identifying as transgender and gender non-binary than ever before. In fact, this February, a study of 81,000 teens in Minnesota, published in the medical journal Pediatrics, found that nearly 3 percent of them – more than 2,000 high school aged kids, just in the state of Minnesota and just in grades 9 and 11 – identified as either transgender of gender nonconforming. Many more responded to the survey that they do not believe boy and girl are the only options. So, with that in mind, perhaps it's not all that shocking that people feel Father Christmas should look more like them.